The spleen is thought to be central in regulating the immune system, a metabolic asset involved in endocrine function. Overwhelming postsplenectomy infection leads to a mortality rate of up to 50%. However, there is still controversy on performing subtotal splenectomy as treatment of splenomegaly due to portal hypertension in cirrhotic patients. In the present study, immunocytes and the indexes of splenic size, hemodynamics, hematology and immunology in the residual spleen were analyzed to support subtotal splenectomy due to splenomegaly. In residual spleen, T lymphocytes mainly were focal aggregation in the periarterial lymphatic sheath. While B lymphocytes densely distributed in splenic corpuscle. In red pulp, macrophages were equally distributed in the xsplenic cord and adhered to the wall of splenic sinus with high density. The number of unit area T and B lymphocytes of splenic corpuscle and marginal zone as well as macrophages of red pulp were obviously increased in the residual spleen, while the number of macrophages didn’t be changed among the three groups in white pulp. While there were some beneficial changes (i.e., Counts of platelet and leucocyte as well as serum proportion of CD3+ T cells, CD4+ T cells, CD8+ T cells were increased markedly; serum levels of M-CSF and GM-CSF were decreased significantly; The proportion of granulocyte, erythrocyte, megakaryocyte in bone marrow were changed obviously; But serum IgA, IgM, IgG, Tuftsin level, there was no significant difference; splenic artery flow volume, portal venous diameter and portal venous flow volume, a significant difference was observed in residual spleen) in the clinical indices. After subtotal splenectomy with splenomegaly due to portal hypertension in cirrhotic patients, the number of unit area T and B lymphocytes, and M∅ in red pulp of residual spleen increased significantly. However, whether increase of T, B lymphocytes and MØs in residual splenic tissue can enhance the immune function of the spleen, still need further research to confirm. The spleen is thought to be central in regulating the immune system, a metabolic asset involved in endocrine function . Overwhelming postsplenectomy infection leads to a mortality rate of up to 50% . How to reduce infectious incidence, maintain splenic immune function or conduct vaccination becomes a hot issue of innovation for surgeons ,. 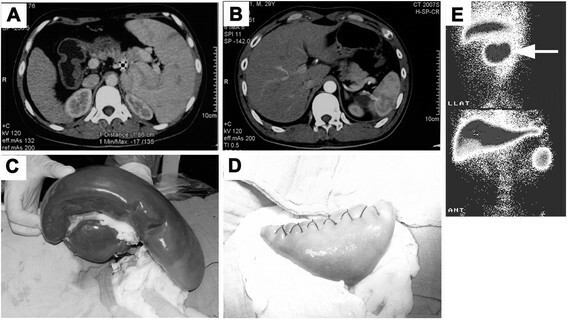 Bierring et al  first reported the study about subtotal splenectomy carried out on the rats. Morgenstern et al  applied this surgical method in clinical practice. Later, a series of research has proven that approximately 25% of the residual splenic tissue can protect against pneumonococcus . Phagocytic function of the splenic remnant after subtotal splenectomy was maintained, and the amounts of T, B cells remained indistinguishable from those in normal circumstances. In contrast, the phagocytic function of the splenic remnant after autotransplantation decreased, autotransplanted splenic remnants showed lower density and abnormal mixing of B and T lymphocytes with widespread loss of follicles and periarterial lymphatic sheath (PALS) ,. Clinical practice shows that subtotal splenectomy applies to splenic injuries, splenomegaly for hematological diseases and portal hypertension -. There is still controversy on performing subtotal splenectomy as treatment of splenomegaly due to portal hypertension in cirrhotic patients. Advocates for splenectomy believe that, with fibrosis and little immune function in splenomegaly, recurrence of splenomegaly and hypersplenism may happen in residual spleen . However, advocates inclined to preserve spleen argue that subtotal splenectomy may reduce portal venous pressure, correct hypersplenism and retain the immune function of spleen-which means killing two birds with one stone . Subtotal splenectomy includes two ways, i.e., with preserving the upper pole and the lower pole of the spleen supplied by the gastrosplenic vessels, spleno-omental and spleno-coloic vessels ,. In the present study, immunocytes and the indexes of splenic size, hemodynamics, hematology and immunology in the residual spleen were analyzed to support subtotal splenectomy due to splenomegaly in cirrhotic patients. Spleen organization were obtained by operating formed splenomegaly group. Patients who had spleen puncture to check for spleen organization 8-years after surgery formed the residual spleen group. Patients who underwent splenectomy but who did not have splenomegaly formed the control group. In residual spleen group, T lymphocytes mainly were focal aggregation in the periarterial lymphatic sheath (PALS), and sporadic or focal distribution in red pulp.while B lymphocytes densely distributed in splenic corpuscle, but was sporadic in red pulp, and its volume was slightly smaller, and dyed deeply (Figure-1A, B). In the splenomegaly group, splenic corpuscular atrophy, PALS narrowed, and their number decreased, splenic sinus stenosis and stasis, splenic cord thickened, densely distribution area of T cells zone reduced, density of B cell around the splenic corpuscular decreased, and B cells in red pulp is slightly less, T and B lymphocytes increased in size, staining lightly (Figure-1C, D). In the control group, T cells densely distributed in PALS, sparsely in red pulp (Figure-1E), B cells were densely distributed in splenic corpuscle, and were scattered in red pulp (Figure-1F). Immunohistochemical staining of T, B lymphocytes and macrophages (M’s) in residual spleen , splenomegaly and normal spleen. (A). Identification of T lymphocytes in PALS of residual spleen. (B). T lymphocytes in PALS of splenomegaly. (C). T lymphocytes in PALS of normal spleen (A-C, immunohistochemistry for CD45RO, ×400 magnification. Bars, 50- μm). (D). B lymphocytes in the splenic corpuscle and red pulp of residual spleen. (E). B lymphocytes in the splenic corpuscle and red pulp of splenomegaly. (F). B lymphocytes in the splenic corpuscle and red pulp of normal spleen (D-F, immunohistochemistry for CD20, -400 magnification. Bars, 50 μm). (G). Identification of MØs in splenic cords and sinuses wall of residual spleen. (H). MØs in splenic corpuscle and MZ of residual spleen. (I). MØs in splenic cords and sinuses wall of splenomegaly. (J). MØs in splenic corpuscle and MZ of splenomegaly. (K). MØs in splenic cords and sinuses wall of normal spleen. (L). MØs in splenic corpuscle and MZ of normal spleen (G-L, immunohistochemistry for CD68, ×400 magnification. Bars, 50 μm). In the residual spleen group, MØs well-distributed in the splenic cord and adhered to the wall of splenic sinus in red pulp, with high density and dying deeply. In white pulp, MØs were scattered in splenic corpuscle, and were concentrated obviously in MZ, and may see larger M∅ (Figure-1G, H). In the splenomegaly group, MØs in the red pulp distributed loosely and irregularly, density obviously lower, understained in color, distribution of MØs in splenic corpuscular and MZ of white pulp was the same as residual spleen (Figure-1I, J). In the control group, MØs equally distributed in splenic cord and adhered to the wall of splenic sinus in red pulp, with high density and dying deeply; distribution of MØs in splenic corpuscular and MZ of white pulp was the same as residual spleen (Figure-1K, L). Residual spleen was preserved about 11 × 7 × 4-cm on operation. It was alive that was confirmed by CT scan, and still had phagocytosis via splenic scintigraphy with 99mTc sulfur colloid after eight years (Figure-2A-E). Images of clinical data. (A&B). CT images of preoperative and postoperative eight years. (C&D). Intraoperative splenomegaly and residual spleen. (E). Splenic scintigraphy with 99mTc sulfur colloid after eight years (residual, arrow). For T and B lymphocytes, significant differences in residual spleen group as compared with splenomegaly group and control group were observed (p < 0.05), and a significant difference was also observed between splenomegaly group and congtrol group (p < 0.05) (Table-1). Compared with the splenomegaly and control group, aP < 0.05; compared with the control group, bP < 0.05. In red pulp, significantly higher the counts of MØs in the residual spleen group as compared with splenomegaly group and control group was observed (p < 0.05). A significant difference between splenomegaly group and control group was also seen (p < 0.05). However, significant difference was not observed among the three groups in white pulp (splenic corpuscle and MZ) (p > 0.05) (Table-2). With respect to splenic length, splenic thickness, splenic square area, splenic artery flow volume, portal venous diameter and portal venous flow volume, a significant difference was observed between residual spleen groups and splenomegaly groups (p < 0.001). Counts of platelet and leucocyte in residual spleen were increased markedly compared with splenomegaly groups, and a significant difference was observed (p < 0.001). With respect to IgA, IgM, IgG, Tuftsin level, there was no significant difference between residual spleen groups and splenomegaly groups (p > 0.05) (Table-3). Serum proportion of CD3+ T cells, CD4+ T cells, CD8+ T cells were in residual spleen increased markedly compared with splenomegaly groups, and a significant difference was observed (p < 0.05) (Table-4). Serum levels of M-CSF and GM-CSF were decreased significantly, there was a significant difference between residual spleen groups and splenomegaly groups (p < 0.05) (Table-5). The proportion of granulocyte, erythrocyte, megakaryocyte in bone marrow were changed obviously, and a significant difference was seen (p < 0.05 and p < 0.01, p < 0.001 or p > 0.05) (Table-6). The spleen is a highly compartimentalized organ, and each compartment has its own structure, cell population, and functions . White pulp PALS contains a large number of T lymphocytes, red pulp reticular meshwork contains MØs and abundant erythrocytes, and MZ is divided into an inner and an outer compartment by a special type of fibroblasts, in which a variety of cell types are combined, such as different types MØs at the inner border, and to a lesser extent, the MZ B cells. For other cell types-T lymphocytes, small B cells, and dendritic cells--the MZ is only a temporary residence ,. The splenic compartments show different kinetics for migrating lymphocytes . Splenic MZ is the pathway of T and B lymphocytes migration, and contains accessory cells (MZ macrophages and interdigitating cells) associated with cell migration ,. It has been reported that the splenic MZ M∅ population has its special function,controlling the retention and trafficking of B lymphocytes, and interacts with apoptotic material entering the spleen from circulation to minimize the immunogenicity of autoantigens ,. MØs display remarkable plasticity and can change their physiology in response to environmental cues, and these changes can give rise to different populations of cells with distinct function . It can be seen that the splenic white pulp and MZ were is a gathering area of mass T , B lymphocytes and specific functional MØs , the core parts of the splenic immune function was called, and its range was depended the number and functions of T, B lymphocytes, and M’s, so it becomes the portal of the splenic immune function. When splenomegaly, there was hyperplasia and hyperactivation of the splenic lymphoid tissue, and CD4+/CD8+ T cell ratios increased, the proportion of CD8+ T cells decreased, immature B cells or immunoblasts will proliferate in response to antigenic stimuli ,. Yamamoto and Li et al. reported that the volume of red pulp of the spleen with portal hypertension was increased in a unit area, the white pulp was scanty of T and B lymphocytes and decreased in a unit area, but it was increased in the whole spleen. Although proliferation and distribution may be disordered, they believe that the spleen with portal hypertension may still have immune function ,. 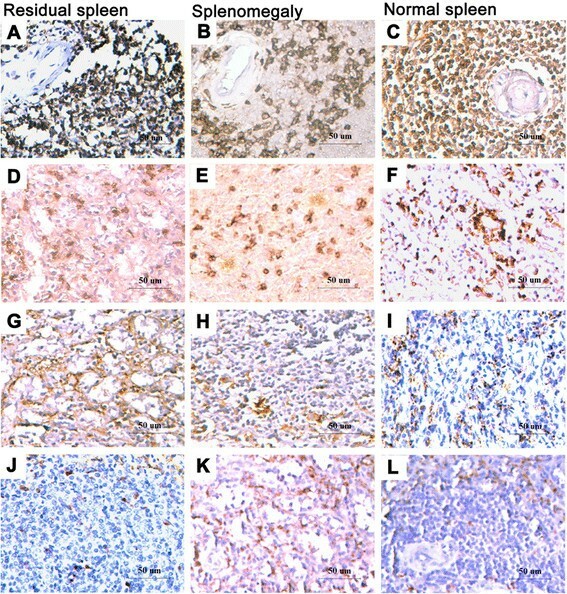 Animal experiments in rabbits and mice, Histological study showed both the total number of cells and the number of cells per gram of tissue were significantly reduced, and antibody response was poorly in autotransplantation after splenectomy. There was a substantial reduction in the percentage of some of the cells examined (CD4+ and CD8+ T lymphocytes subsets), but not all (B lymphocytes, ED1+ and ED2+ macrophages, OX2+ and OX6+ cells). This results suggests that the regenerated spleen can maintain T cell number, but cannot compensate for the immunological function of the original one,especially host resistance to infection ,. Li et al. reported the relative quantity of MØs per unit weight of splenomegaly decreased significantly, however, total quantity of MØs increased significantly, so rhe results suspect the latter was relatively increased due to enlargement of splenic volume . Whereafter found that the phagocytosis rate and phagocytic capacity of M∅ in splenomegaly was more higher than the control group, nevertheless this prompt that macrophage phagocytosis may be positively correlated with the degree of hypersplenism . A group of researchers show that, in the patients of splenomegaly with immune thrombocytopenia,the phagocytosis rate in splenic macrophages positively correlated with the ratio of Th1/Th2, but negatively correlated with percentage of Th2 cells . Thus, splenomegaly and hyperdynamic blood can cause the splenic structure change, the numbers of T and B lymphocytes as well as MØs in unit area or volume decreased. This finding suggested that splenic tissue structure is closely correlated with the quantity of T, B lymphocytes and M’s, while whether remodeling of these cells would affect the splenic immune function still remained controversy. In this present study, the histological features of the residual spleens which were reserved was discovered as follows: Firstly, the size of the residual spleen was similar to normal. Secondly, the number of splenic corpuscle and PALS increased, the morphous of the splenic sinus approximated to normal, structure compact. Thirdly, T lymphocytes shaped focal aggregation in the PALS. Fourthly, B lymphocytes densely distributed in splenic corpuscle. Fifthly, MØs were evenly distributed in the splenic cord and adhered to the wall of splenic sinus in red pulp, increased density and dyed deeply, they were diffused distribution in splenic corpuscle of white pulp, and more densely distributed in MZ, with larger cell volume. Quantitative analysis of the cells showed that Significantly higher counts of unit area T and B lymphocytes in the residual spleen group obviously increased as compared with splenomegaly group and control group, while splenomegaly group significantly decreased than control group. Significantly higher number of unit area MØs of red pulp in the residual spleen group obviously increased as compared with splenomegaly group and control group, but splenomegaly group significantly less than control group. In addition, hemodynamics of the residual spleen and portal vein improved, amounts of platelet and leucocyte rose to normal, and there were no significant changes in immunological indexes. Results suggest that subtotal splenectomy may reduce portal venous pressure, correct hypersplenism and retain immune function of spleen. Our study demonstrated that the distribution characteristics of M∅ in red pulp resembles Vasco’s report . MZ MØs are larger and morphologically distinct from other macrophages ,. Our results suggest that high hemodynamic bood plays an crucial and initial role in adaptive changes of splenomegaly tissue. Splenic histological remodeling must be involed in migration and redistribution of cells, when hemodynamic blood reversed in residual spleen. Quantity of T and B lymphocytes per unit area in their respective function zone of residual spleen increased, that may enhance the ability of immune response in the residual spleen. M∅ accumulation remodeling in red pulp of the residual spleen indrectly reflected that hematopoietic function of red pulp enhanced. Splenic marginal zone was the pathway through which lymphocytes migrated from the white pulp into red pulp, where lymphocytes closely contacted with MØs and interdigitating cells, and participated in the immune response after being activated ,. There was no significant difference in counts of MØs in white pulp and MZ among the three groups, indicating that number of M∅ involved in immune response didn’t decrease due to fibrosis in groups of residual spleen and splenomegaly. Besides, after subtotal splenectomy with splenomegaly due to portal hypertension in cirrhotic patients, serum proportion of CD3+ T cells, CD4+ T cells, CD8+ T cells were increased markedly and serum levels of M-CSF and GM-CSF were decreased significantly. Results suggest that residual splenic tissue can enhance immune reaction and weaken inflammatory reaction. The proportion of granulocyte, erythrocyte, megakaryocyte in bone marrow were changed obviously. Results suggest that the spleen inhibited the bone marrow, and haemocyte function was removed. Our previous study found that there was no significant difference in the content of collagen, elasticity and reticular fiber between the residual spleen and splenomegaly. The ultra cell structure of the residual spleen was similar to that in normal spleen, suggesting fibrosis presented and cell morphology was normal in residual spleen. The change of immune cells and heamodynamic, hematological and immunological indices proves that it is feasible and necessary to implement subtotal splenomegaly for portal hypertension. We believe that the residual spleen has its special artery blood-supply, maintaining the tissue structure and cell function of the spleen on one hand, and improving the status of high-pressure and hypoxia in the spleen on the other hand. Rectification of hypersplenism, extrication from high-pressure and cease of fibrosis in spleen was all conducive to accumulation, growth and performance of immune function of T, B lymphocytes and MØs in white pulp and MZ of the spleen. These discoveries of ours have considerable clinical guiding significance for deciding between -exsect- and -reserve- for splenomegaly due to portal hypertension. Cores function of the spleen is immune function, and alteration of immunocytes in residual spleen can reveal regularity of inherent function in fibrosis spleen. However, whether increase of T, B lymphocytes and MØs in residual splenic tissue can enhance the immune function of the spleen, still need further research to confirm. Because our sample size was small, a multi-centre large-sample study is needed. Nevertheless, this study provided interesting information: after subtotal splenectomy with splenomegaly due to portal hypertension in cirrhotic patients, the residual spleen still has immune function. Subtotal splenectomy for splenomegaly due to portal hypertension results in a significant increase in the number per unit area of T cells and B cells, and in the number of macrophages in red pulp of the residual spleen. Ethical approval of the study protocol (No. 5986) was approved by the Human Research Ethics Committee of the Weifang Medical University. All individuals provided written informed consent before being included in the study. Our studies relating to subtotal splenectomy started in 1984. Up to 2012, we have conducted 752 operations of subtotal splenectomy (preserving the lower pole, normal spleen size of splenic tissue, splenic omentum and splenocolic vessels for the purpose of blood-supply), with 117 cases for splenic trauma and 635 for splenomegaly due to portal hypertension. Thirteen tissue samples were collected from patients in the 89th Hospital of the People’s Liberation Army (Weifang, China). thirteen cases (7 males and 6 females; mean age, 31 (26-36) years)) with splenomegaly due to portal hypertension who had received subtotal splenectomy plus fixation of the posterior sternal omentum majus were included in this group. Patients were confirmed to have cirrhosis after hepatitis-B infection, HBV-DNA was negative and were classified as class A or B according to the Child-Pugh classification. Cirrhosis was accompanied by hypersplenism with light or moderate varicose veins of the lower esophagus, and the fibrosis level in the spleen was III. Color Doppler ultrasound was used before surgery and 8-years after surgery to measure the size of the spleen. The preoperative long-diamater was 48 × 5-cm, the transverse diameter was 30 × 4-cm, and the pachy- diamater was 10 × 2-cm. The postoperative long-diameter was 11 × 1-cm, the transverse diameter was 7 × 1-cm, and the pachy-diameter was 4 × 1-cm. Spleen organization were obtained by operating formed splenomegaly group. Patients who had spleen puncture to check for spleen organization 8-years after surgery formed the residual spleen group. Thirteen cases (7 males 6 females; mean age, 30 (28-37) years) who underwent splenectomy but who did not have splenomegaly formed the control group. Guided by color Doppler ultrasound, hollow-needle biopsy was used for to obtain samples of residual splenic tissue . Thirty nine tissue samples were collected. Specimens were fixed in 10% formalin, dehydrated, embedded and sliced. Each specimen was made into 15 slices (5 slices per group). PH 8.5, EDTA antigen retrieval, 3% peroxide-methano and goat serum closed by SP immunohistochemical method. CD45RO antibody (Sunbio, Shanghai, China) was used to specifically stain T-cells, and CD20 antibody (Sunbio) was used to identify B-cells, whereas CD68 antibody (Sunbio) was used to identify macrophages (M’s). Samples were then diluted in phosphate-buffered saline (PBS) and colored with 3,3-diaminobenzidine (DAB). Dehydration, clearing, and mounting with neutral gums was carried out. A negative control group was obtained using the same steps as described above, but instead the antibody was replaced by PBS. After staining, slices were observed under a light microscope (BX51; Olympus, Tokyo, Japan) for histomorphological analyses. Under light microscope (-400), Image-Pro Plus (Media Cybernetics, Silver Spring, MD) was used to calculate the the counts of T, B lymphocytes and M’s, respectively. Three effective visual field of each section were selected, calculated the counts of positive T, B lymphocytes per pixel area in aim area, and then counted the mean (pixel density was 2.88 pixels/μm) ,. Selection criteria of measuring region: T lymphocytes- measurement area was PALS, and B lymphocytes- measurement area, including marginal zone (MZ) and part of red pulp. And the measuring region of MØs included red pulp and the splenic corpuscular and MZ of white pulp. In addition, patients underwent complete physical examination before and after the operation, which included abdominal ultrasonography (splenic size: splenic length, splenic thickness, splenic square area; hemodynamics: splenic artery flow volume, portal venous diameter, portal venous flow volume), abdominal CT scan, splenic scintigraphy with 99mTc sulfur colloid, laboratory hematological (platelets, leucocytes) immunological (serum IgA, IgM, IgG, Tuftsin, CD3+ T cells, CD4+ T cells, CD8+ T cells, M-CSF, GM-CSF) and bone-marrow evaluation. Data analyses were carried out using SPSS 17.0 (SPSS Inc., Chicago, Illinois). All values are means × standard deviation (SD). Groups were compared by the t-test. P < 0.05 was considered significant. T-GZ performed flow cytometry analysis, analyzed data, wrote the paper. F-GJ, Y-BX, KL, and H-JS collected and analyzed clinical data. TW and MW performed flow cytometry analysis, analyzed data, made graphs. W-JG designed study, analyzed data. J-HZ and J-YT completed statistical analysis. H-BC and X-JZ designed study, analyzed data, wrote the paper. All authors read and approved the final manuscript. We thank Lingyan Ju, Zehui Jiang for technical assistance. We are also grateful to the staff of the center of general surgery, the 89th Hospital of PLA. Below are the links to the authors original submitted files for images.